Hosted and Virtual PBX Phone System: Cebod telecom "
There was a time not so long ago, when the businesses looking to use multiple phone lines had to install a special type of equipment known as the PBX or Private Branch Exchange. This advanced phone system is capable of handling multiple calls at the same time, and offers a host of manual and automated features. However, using these sophisticated phone systems has always been a challenge for the medium and small scale businesses because of their high cost and technical complications. 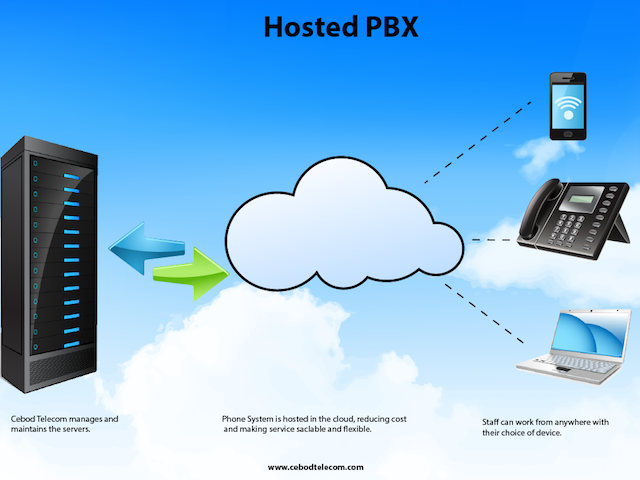 What does Hosted or Virtual PBX Mean? Hosted or virtual PBX is one of the latest developments in the field of business telecom technology that allows the relatively smaller businesses the luxury of a sophisticated phone system without spending a fortune on expensive telephone equipment. Technically speaking, this is a Private Branch Exchange or PBX that is delivered by a Voice-over-IP (VoIP) service provider as a hosted service. Without making any significant investment, a virtual PBX user can enjoy the most sophisticated telephony features including faxing, voicemail, call logs, call auditing, conference call, touchstone menus, automated greetings, and much more. With a hosted PBX, the employees of your business can work from their home or on their mobile devices while remaining connected to the telephone system of the office. Hosted PBX service providers handle activities such as switching or call routing at their own locations. Most importantly, all the PBX related equipment and software required to enjoy the virtual PBX service are also managed by the service provider. A virtual or hosted PBX service can function over the internet (via VoIP or internet telephony), over the Public Switched Telephone Network (PSTN), or over a combination of these two. Savings: Virtual PBX relieves the users from spending on the traditional landline network and the PBX system. They can also make significant savings on their monthly bill. Set-up is easy, and requires no expensive hardware. Flexibility: Virtual PBX systems make use of plug-and-play handsets that are preconfigured. Regardless of their location, users are able to make calls from their business phone system. Therefore, your business is not restricted within the office. Scalability: Virtual PBX provides a scalable phone system that can be expanded as per the needs of the business. It is effortless to add extra lines when one or more new employees join the organization. Top-of-the-line features: Hosted or virtual PBX allows even the smallest of businesses to enjoy advanced phone features such as call diversion, call hold, auto attendant, voicemail, fax, and much more. Enhanced customer service: Utilizing their virtual PBX phone network, businesses can create an alternate route for the unanswered inbound calls by diverting them to other work stations or an external mobile/landline. Better call quality: With a hosted PBX, users can enjoy the best possible call quality within their budget. Geographically independent phone numbers: While using a hosted PBX phone system, the phone numbers are no longer anchored to the office. As a result, it becomes much easier to move offices or work on the go.